The BBC has learnt of allegations of state-sanctioned violence in Kenya during the turmoil that followed last December’s disputed presidential poll. Sources allege that meetings were hosted at the official residence of the president between the banned Mungiki militia and senior government figures. The aim was to hire them as a defence force in the Rift Valley to protect the president’s Kikuyu community. The government denied the allegations, calling them “preposterous”. “No such meetings took place at State House or any government office,” the government said in a statement posted on its website. Such “unfounded lies” are “injurious to the president, government and the people of Kenya”, the statement said. Although parliament’s focus will be on healing ethnic divisions and creating a coalition government – allegations of state involvement with a banned Kikuyu militia, known as Mungiki, will not go ignored, the BBC’s Karen Allen in Nairobi says. She says there is of growing suspicion that some of the violence that led to 1,500 people being killed and hundreds of thousands displaced was orchestrated by both sides of the political divide. On the weekend of 25 January, the Rift Valley towns of Nakuru and then Naivasha were the focus of the some of the worst post-election violence. 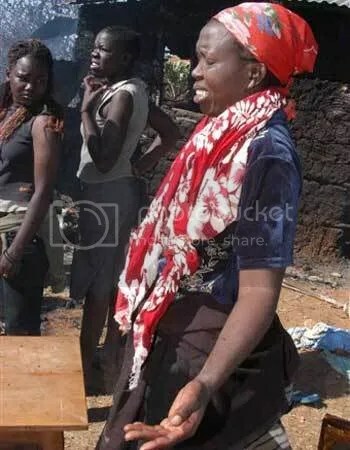 Eyewitnesses spoke of non-Kikuyu homes being marked, then gangs with machetes – who they claim were Mungiki – attacked people who were from other ethnic groups. He alleges that in the hours before the violence in Nakuru, police officers had orders not to stop a convoy of minibus taxis, called “matatus”, packed with men when they arrived at police checkpoints. “When we were there… I saw about 12 of them [matatus] packed with men,” he said. “There were no females… I could see they were armed. The allegations come at a time of growing concern that there was pre-planned violence on both sides of the political fence, in the aftermath of Kenya’s disputed election result. Maina Kiai warned that Mungiki were being activated by the government in January. An earlier report by Kenyan Corruption and Warlords here. 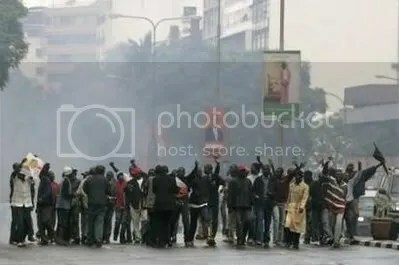 The Government of Kenya has been shocked by a story appearing on the BBC that alledges that members of the banned group Mungiki held meetings at Statehouse, Nairobi, the Official Office of the President. This story is preposterous, baseless and at best defamatory. No such meetings took place at Statehouse or any Government Office. It is injurious to the President, Government and the People of Kenya for BBC to run such unfounded lies. What credible sources do the BBC have and what is the motivation of the BBC in running untruths and manufacturing such allegations? Why didn’t the BBC seek comment from the Government of Kenya before airing the story? The Government of Kenya will write to demand an apology, a retraction and an inquiry into the motive of the producers of the story. The Government of Kenya takes great exception to the story, which is coming days after signing of a peace agreement, and can only conclude that the producers of the story are trying to dent the hopes of Kenyans and incite Kenyans into violence. Kenyans should not believe the dangerous lies on the BBC story and should nurture the peace we enjoy with the knowledge that not everyone is happy that we are a stable country and that an African solution to the Kenyan crisis has been found. The Mungiki sect is a criminal organization that has been banned by President Mwai Kibaki’s Government. Last year, the Government embarked on a special operation to wipe out the banned group and arrested its key leaders. The Government of Kenya has never worked or engaged banned criminal organizations for any work. “My father was shot as he stood in front of our house. The police were shooting indiscriminately, targeting anyone on sight. My father was shot in the stomach,” witness Alphonse Otieno said today by phone from Kisumu’s Kondele slum. Proof that Kenyan GSU are using live rounds to kill demonstrators. A Kisumu demonstrator is shot dead in cold blood in Kondole, another is kicked brutally when he is down and dying. They are being hunted down as this video shows. BBC clip here. Be warned: both clips are graphic and distressing. Therein lies the problem. 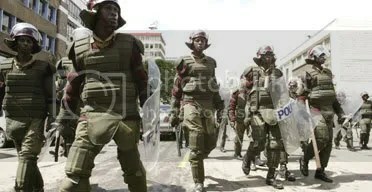 The Kenyan government should not be sending the GSU armed with kalashnikovs and live bullets to police the demonstrations. I do not condone police violence at all, whether by clubbing or bullets, but make the point that arming paramilitary forces leads inexorably to those arms being used against innocent civilians and with the inevitable loss of life following closely behind. Coercion of this sort does not quell violence, it nurtures it. We do not want to provoke them yet. Non-violent actions turns violent when the other side uses violent means to suppress them. Using tear gas and bullets only ratchets up violence. Take the GSU out of the equation and the demonstrations would in all likelihood remain peaceful. The government must also lift the ban on rallies as there is no valid reason for assuming that “criminal elements” are taking advantage of them. Joseph Karoki has posted photos of victims of police brutality on his blog. Graphic image. Much of the worst violence has occured in Kisumu where many protestors have so far been shot dead. There are no reliable figures yet for how many have been killed to date. There are claims that 53 people have died and of those 44 have been killed by bullets. People are enraged by this; many of them did not vote for Kibaki and now he sends his guns in to shoot them dead. Frustration and anger levels are rising so it may now be too late to put the genie back in the bottle. The police chief Grace Kaindi said she had no regrets about giving the “shoot to kill” order. Her statement to AP press is contradictory. She claimed that she feared the police would be overwhelmed by the demonstrators and then later said that all those killed were “looters and thieves.” Belying the video footage shown at the top of this post. Human Rights Watch has criticised the apparent “shoot to kill” policy by demanding that Kenyan police follow the United Nations Basic Principles on the Use of Force and Firearms by Law Enforcement Officials, which state that law enforcement officers must apply non-violent methods when at all possible, leaving force as a last resort and only in proportion to the offence committed. According to HRW even people who were not part of the demonstrations were hit by stray bullets. Yesterday’s demonstrations in Mombasa, Kisumu and Eldoret remained peaceful until police started shooting tear gas and live rounds. The police ferried the bodies of the men they had shot to the mortuary. In the chaos, they brought some in alive, mixing them up with the dead, a priest said. Their suffering as they were left to die amid the corpses is unimaginable. Millions of Kenyans are very outraged by the brutal execution, captured by one of KTN’s courageous camera persons of a young protester in Kisumu whose capital offence appears to have been nothing more than making faces at and playing hide and seek with heavily armed goons in para-military gear… But does he have a name? Let me resurrect him in a sense by telling you a few things about him. His name was George Williams Omondi Onyango. He was twenty two years old. He was a mechanic employed by Simba Line Motors in Kisumu. He lived in the Migosi area of that western Kenyan town. He was also my brother-in-law. His older brother is married to my youngest sister. Like every other television viewer in Kenya, I was gnashing my teeth and cursing the illegal and criminal assault on unarmed peaceful demonstrators all over Kenya. I was expressing my outrage in my living room watching the news at nine pm when my cell phone rang and I saw it was my sister calling. She was sobbing uncontrollably, asking me if I had seen the segment on the news about the young man being shot. I replied that I had seen the piece at 4 pm, at 7 pm and now at 9. Choking and wailing, she told me between bouts of weeping who the executed young man was. To say I was stupefied with additional shock is probably the understatement of this week. I have been dipping into James Dianga’s book Kenya 1982 The Attempted Coup, The Consequence of a One Party Dictatorship ever since it was brought to my attention a couple of weeks ago and was intrigued to read why the GSU was formed. Kenyatta did not trust the army because the officer class was dominated by Kambas while the rearguard was made up of Kalenjins. Kenyatta was disdainful of the army because there were hardly any Kikuyu in its ranks and he believed it was made up of illiterates. For these reasons Kenyatta could not wholly rely on it so the GSU was formed alongside the Kenya Air Force. These two units consisted of carefully selected Kikuyus from Central Province and Kiambu and their function was to act as a bulwark against the Kenyan Army. ‘political force, the regime’s coercive arm against its internal enemies’. Targeted for rapid transformation into a virtually all-Kikuyu hit squad, with its base at Gatundu, close to the President’s estate, there could be little doubt about the function of the G.S.U. 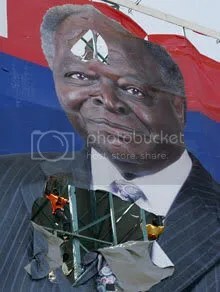 Kibaki is in trouble for sure. The Financial Times points out that Kibaki’s government is illegitimate in a scathing editorial which condemns Kibaki’s election as not fair or free while drawing attention to the blatant vote-rigging and ballot box stuffing as incompetent. It should be made clear to Mr Kibaki that his government is illegitimate. If he refuses to accept that, the western powers should suspend programme aid and devote the money to emergency relief and and supporting any more muscular AU intervention. Visas should be refused not only to corrupt officials, but to Mr Kibaki and his team. If Mr Odinga and his inner circle are seen to encourage violence, the same sanction should apply to them. they may also fear the personal consequences of an Odinga presidency. Mr Odinga, a former political prisoner, swore during election campaigning that he would pursue officials for past human rights violations and corruption. “I think they could not contemplate Raila and his people having the keys to the intelligence files. There are too many skeletons in the cupboards,” said a Nairobi based political analyst. Kibaki is blamed for stoking resentment against Kikuyus. Elsewhere in the paper, the International community is blamed too for supporting one of Africa’s most corrupt regimes in a country which has seen the increasing pauperisation of Kenya’s people with 48% of the population living below the poverty line in 1990 having grown to 56% today, despite development agencies being pumped with aid. Attention is drawn to the widening gap between the haves and have-nots, high unemployment, the doubling of the population in 25 years and the lack of land as underpinning the crisis. People have nothing to lose and are now venting their fury at seeing hopes of change that transcend ethnicity being dashed. Western media continue to portray the breakdown as a tribal division between Kikuyus and Luos, however, it is the Kalenjin who are killing Kikuyu in Eldoret and elsewhere angry reactions can be attributed to the election being stolen. Commentators are asking for pressure to be placed on the government by the EU and chuck Kenya out of the commonwealth. None of these measures should be applied at this stage. Dialogue has to take place between Kibaki and Odinga first and some agreement made on power-sharing until new elections can be held. Odinga and Kibaki need to get off their high-horses and act now. Stories from the church massacre in Eldoret are now coming out. A woman described how women and children were shut in the church and the door locked after it was torched. There was no escape except through windows at the back. She managed to escape through the window with her 3 year old daughter, leaving behind 2 of her other children, only to be met by attackers who grabbed her child and threw her back into the fire. 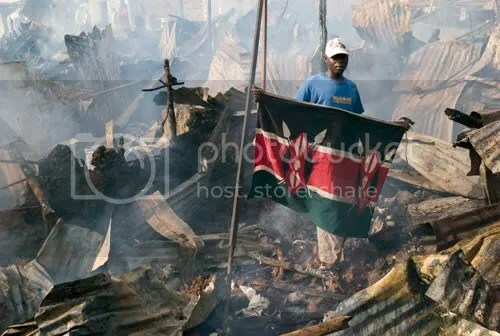 Karanja, 37, helped pull out at least 10 people, but added, “I could not manage to pull out my sister’s son. He was screaming ‘Uncle, uncle!’ … He died.” The boy was 11. Up to 50 people were killed in the attack, said a Red Cross official who spoke on condition of anonymity because her name would identify her tribe, and she feared reprisal. Even first aid workers were stopped by vigilantes who demanded their identity. “The worst part is that they were hacking people and then setting them on fire,” he added. A Red Cross worker said that psychotherapists are to be brought in to deal with the trauma. People are still fleeing to schools, public building and police stations. At the police station security is extremely tight. The displaced families camped with the police compound are surrounded by police in riot gear who are guarding them. Riot police are patrolling Nairobi slums after the riots but today has been quieter. Kibera residents are leaving with their possessions, mostly Kikuyus who are worried that they will be attacked. 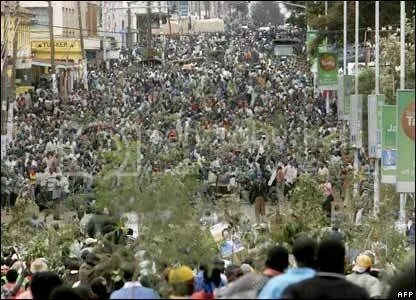 Crowds speaking to a Radio 4 reporter today denied that the clashes in Kibera were motivated by tribal differences. People said they were angry that they voted for Raila Odinga and they had been denied their rightful victory. Members of the crowd said they were ready to die for their rights. The residents insisted they would be going to the mass action rally tomorrow, even if they are killed. UPDATE: 16:00 GMT Odinga’s stance is softening, Deutsche Welt TV showed him saying that he is not prepared to talk to Kibaki without international mediators. The AU head and Ghanain President is expected in Nairobi today. Today Odinga refused to attend the meeting at State House called by Kibaki and at a press conference criticised Kibaki for the deaths of protestors who have been killed by the GSU since the troubles began. UPDATE: 19:00 GMT BBC Radio 4 is now reporting that hopes for a resolution to the Kenyan crisis are fading now following remarks by Mwai Kibaki that Kenya’s problems are an internal matter for Kenyans to sort out. A snub to the head of the African Union, Ghanaian President John Kufuor who is expected in Nairobi today and who was expected to mediate between Kibaki and Odinga’s parties.